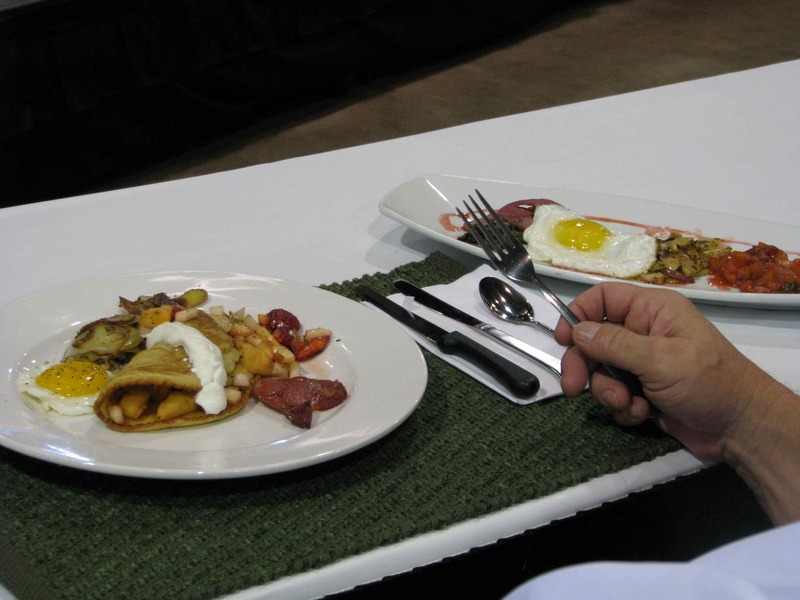 If you didn’t know, the Arkansas Iron Chef competition takes place annually on the Arkansas Hospitality Association convention and tradeshow floor, over the two days of the conference. Thanks to winning a couple silent auctions Tuesday night, I had the opportunity to sit in on yesterday’s Heat 2, and today’s final round. Iron Chef Heat 2 dish by Chef Jacob Peck and Sous Chef Greg Wallis of Forty Two. 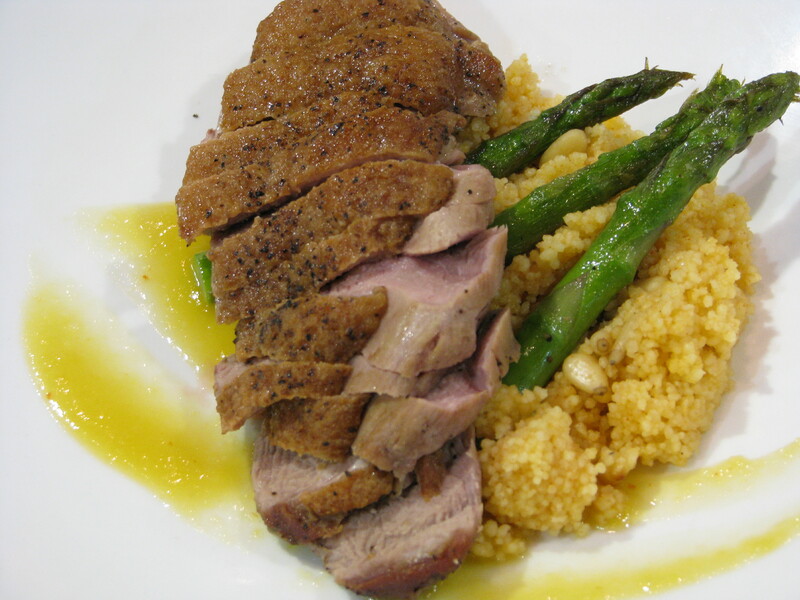 Roasted duck with a mango gastrique, asparagus and couscous. Iron Chef Heat 2 entry by Chef Jason Godwin and Sous Chef Willie Yearwood of Simply the Best. 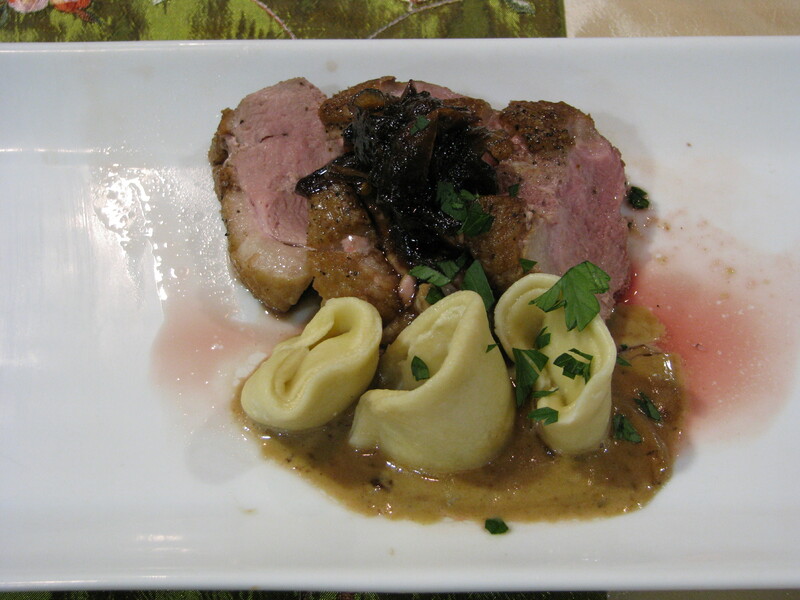 Seared duck breast with tomato onion jam, asparagus and mozzarella tortellini, and mushroom cream sauce. I’m not going to pick favorites here, as they were both incredible. But let me just tell you…that “onion tomato jam,” as bizarre as it sounds to most of us, was slap-your-momma good. I was literally whacking the table. Mmmm. But both were wonderful, and Forty Two won the heat with tons of points, carrying them immediately to the final round. **Intermission** I have to tell a funny story. I thought all this time that my second silent auction prize was for the Semi-Final round. It said so on the ticket. I sit down today at the appropriate time, and the folks in charge politely shoo me out, as someone else had won that tasting. Turns out that my ticket was misprinted, and I had, in fact, won the FINAL round tasting. Booyah! Me 'n' Mona about to eat some good stuff. Since I had so much food to myself yesterday for Heat 2, I invited a friend, Ramona Collins (@monaspoeticwax) to eat with me. Our lives have crossed paths in several weird ways over our lives, and we’re just now getting to know each other. What a great way to do so, over great food! Iron Chef Final Round dish by Chef Osi Imomoh and Sous Chef Howard Austion of Southland Park Gaming & Racing. 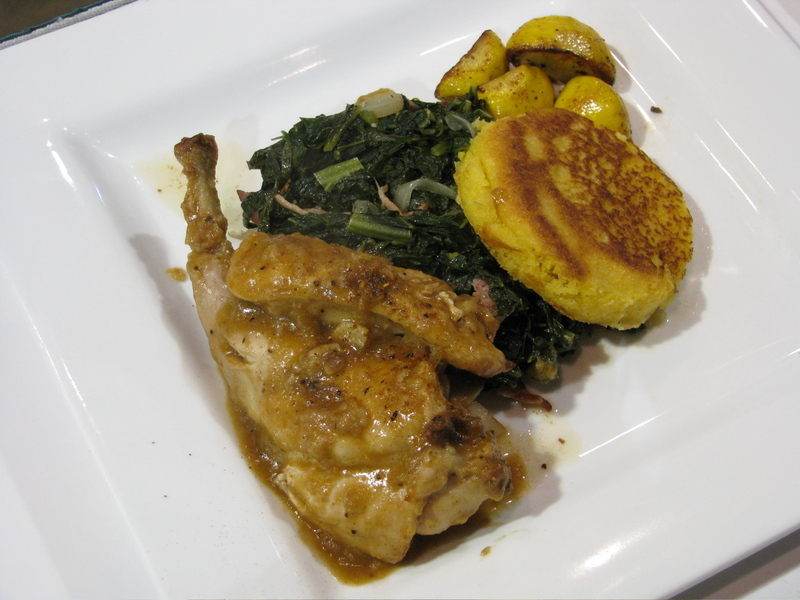 Smothered rabbit with cornmeal johnnycake, greens and roasted squash. Iron Chef Final Round dish by Chef Jacob Peck and Sous Chef Greg Wallis of Forty Two. 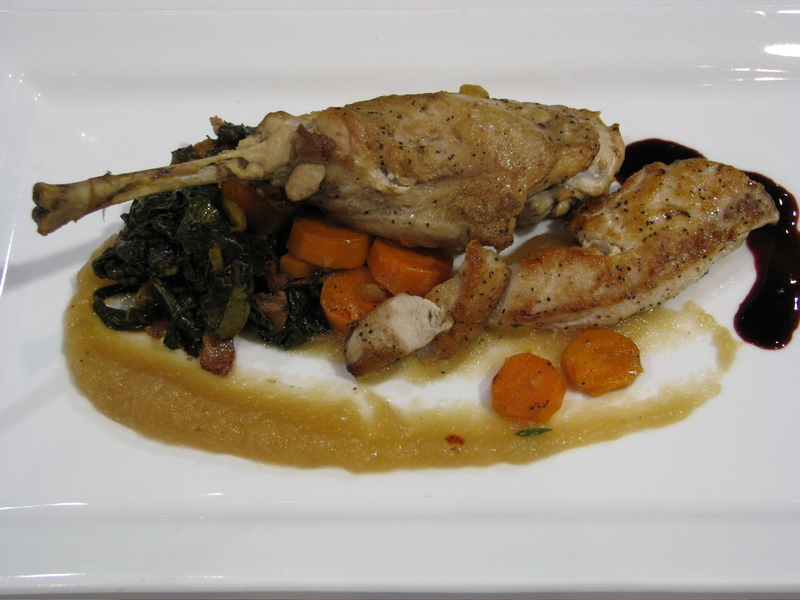 Roasted rabbit with a raspberry coulis, sweet applesauce, carrots and greens w/bacon. 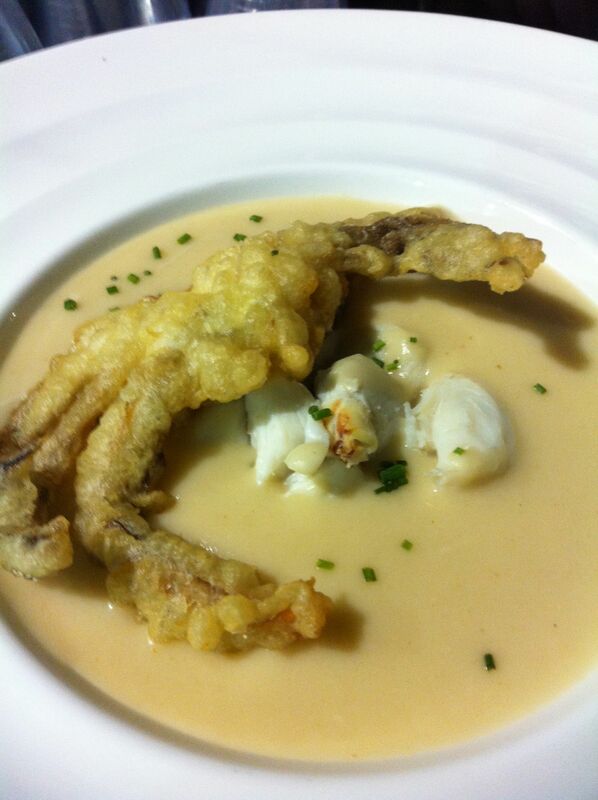 This was the winning dish. Today, I spent a good part of the day at the Arkansas Hospitality Association’s annual tradeshow and convention. I love conventions, especially this one! Lots of great opportunities to rub elbows with fellow foodies. This was especially so at the Iron Chef competition, which had its first several heats today. I got to be a taster (but not a judge) in the second heat today. Each round had a new protein for the secret ingredient; the protein for the round I sat in for was duck. Yum! Tomorrow, I get to be a taster again in the semi-final round. I’ll hang out for the final round and report more at that time. If you absolutely need at least one or two photos of Iron Chef right away, follow me on Twitter (@ARFoodie) and check out my Twitpics from today. Meanwhile, I want to give you the final scoop on yesterday’s post, the Arkansas Chef’s Culinary Classic. The AHA folks haven’t gotten back with me on all the final winners (they’re busy with the convention and all), but I’ll update as soon as I have that info. Watermelon and mint salad with balsamic vinegar by the Chef Osi Imomoh and Sous Chef Howard Austion at Southland Park Gaming & Racing. Must get recipe…there were two unusual types of melon involved. Beautiful lamb chop with a fruit relish and Asian salad by Chef Jamie McAfee of the Pine Bluff Country Club. 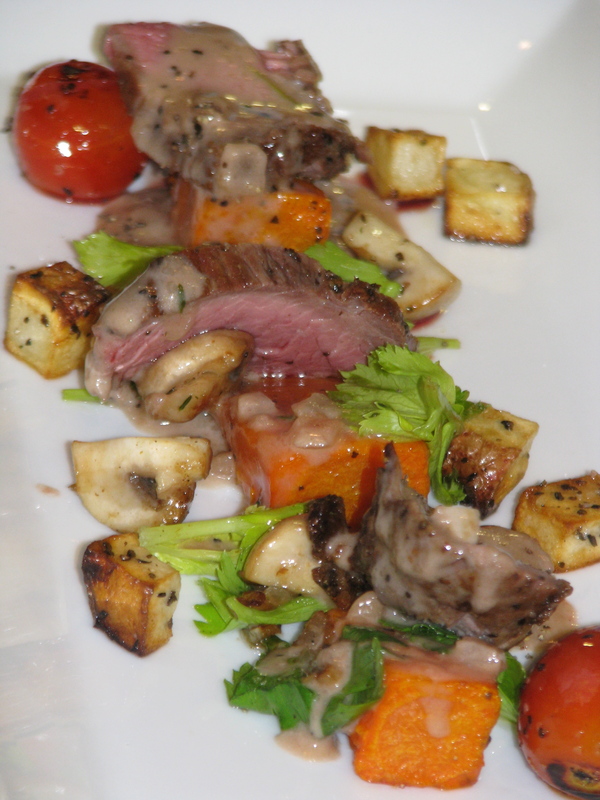 London broil steak salad by Chef Tyler Husser and Chef Jerry Dolson of Hilton, Little Rock. Saffron shrimp bisque by Chef Donnie Ferneau of the restaurant Ferneau. An amazing Tahitian vanilla bean gelato with homemade maraschino cherries by Chef Adam Hanry of the Ozark Conference Center. This won best dessert, and rightfully so. I also had to mention separately a remarkable find, but one you won’t be able to visit. That is, unless you work at the Dillard’s corporate offices on Cantrell. Bistro 1600, exclusively owned and operated by the food and beverage services of said corporate office, offered an impressive lineup. Hubby and I could not believe the food was not from a hoity-toity downtown restaurant. 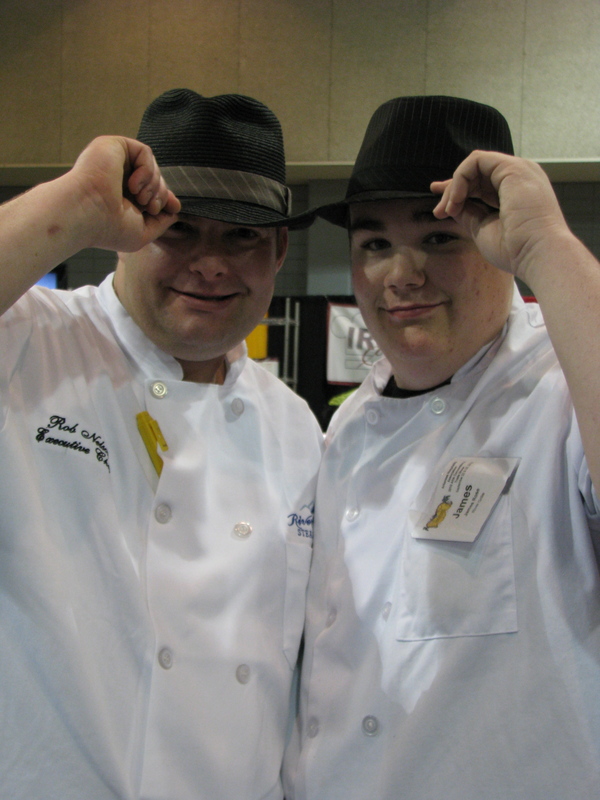 Chef Norman Geisselbrecht, Chef Michael J. Mass and Chef Marjis Meti presented dishes nothing less than divine. (My notes, other than WOW, got mixed up. In order to get the exact dishes right, I’ll have to update when I get the list.) The chefs were excited about food and about pleasing the diner, whether that be a top executive or hourly grunt. Well, I just spent about half an hour writing captions for all these photos, and the computer ate them somehow. Until I put in a new plugin (I’m thinking something Flash based), you’ll just have to guess what each is. But they sure are purty! 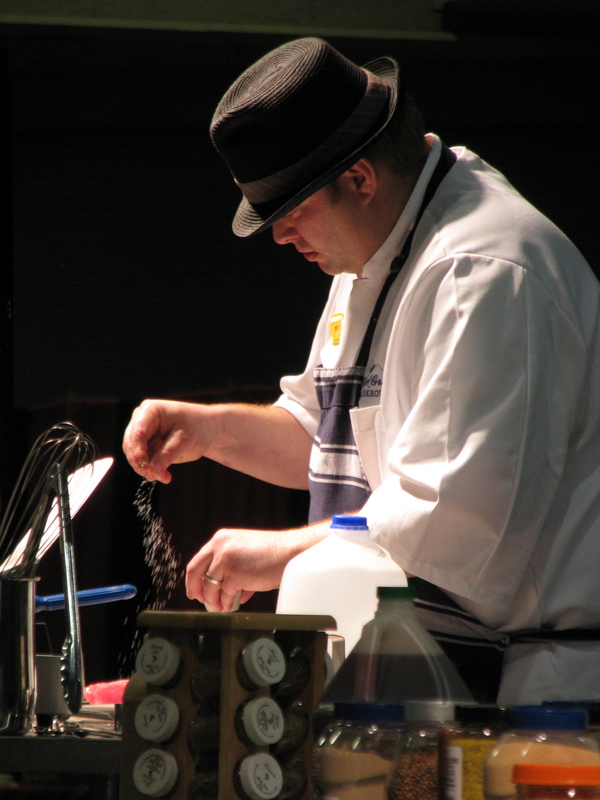 What a busy foodie week…more tomorrow on Iron Chef, the AHA convention, and…oh yeah…tomorrow’s Taste of the Town in North Little Rock. Eat up! I don’t have time to write the entire post this event deserved, but I had to give you a little taste of what hubs and I experienced tonight. Tomorrow begins the Arkansas Hospitality Association’s annual convention and tradeshow. I love conventions — one of the things I actually miss from my PR days — and all the events that go with them. As a preview event, tonight AHA had many of the top chefs across the state prepare small dishes and compete for cash prizes. Hubs and I ate all kinds of wonderful things, to the point that we were surprisingly stuffed from all those teeny plates. But the most fun, for me, was to visit with all the chefs and “talk foodie.” I just about had a spell listening to Chef Donnie Ferneau (of the restaurant Ferneau) explain to my hubs why his Saffron Shrimp Bisque reminded my man of his days in Charleston, SC. Something about classical French technique, velouté sauce, and I got a little woozy after that. I’ll have an update of who all made what and won what, along with more photos of the participants, tomorrow or so. But for now, I just wanted to share a little taste. London Broil Steak Salad from Hilton of Little Rock, and Wild Mushroom Soup and Tuna Tartare from The Peabody Hotel. My pick for winner of the night...simple, yet stunning. Roasted beef tenderloin w/compound butter sauce from Chef Jason Knapp of the Governor's Mansion. Me eating tuna tartare for the first time. I was surprised I actually liked it.